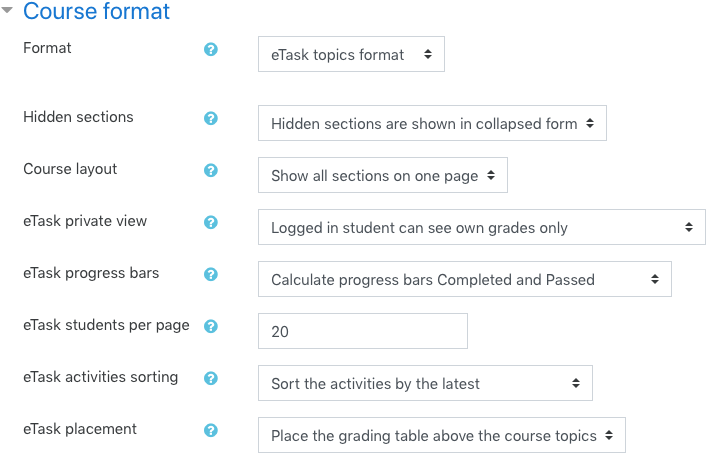 eTask topics format is based on the topics format and includes grading table (above or below the course sections) with aditional functionality such as a highlighting of grading values, grade to pass settings, motivational progress charts and much more. Grading table placed on the top of the course, highlighting grading values, easy set up of grade to pass, motivational progress bars, groups support, pagination and more ... this is eTask topics format – powerful and easy to use! Motivates your students even more! Activity popover provides progress bars of completed and passed activities. Students can see progress of completed activities as well as passed. Private mode is back in a play! No private data like grades of other students – motivational progress bars only. Progress bars are calculated by default. Due date in popover shows expected completion date if due date is missing. Privacy? No problem! Set up private view in eTask settings and display real data in progress bars even if only one student is shown. By default, private view is disabled. If you enable it, students can see only their own grades, othervise they see grades of all students in the course or in the course group. Be careful and set this private view before using this course format in a course! Grade to pass – the simplest way to set up. 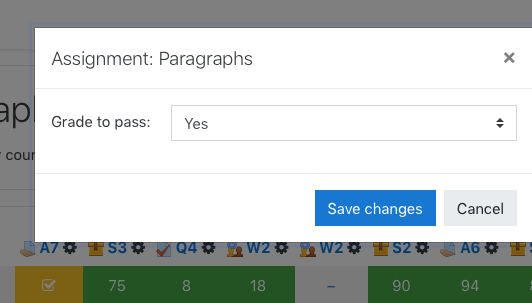 Set up grade to pass simply – in a course editing mode you can open activity modal, set grade to pass and save – thats it! It is possible to use user defined scales. It is necessary to define scales ascending (from the worst to the best value), e.g. No, Yes or F, D, C, B, A! Activity completion – so powerful tool! Activity completion is enabled by default in Moodle 3.3, 3.4, 3.5 and 3.6. You can manage Activity completion in each of the course activity. In Moodle 3.1 and 3.2 Enable completion tracking in Course setting and you can manage Activity completion as well. Moodle 2.9 and 3.0 has disabled activity completion by default. Go to Site administration -> Advanced features and Enable completion tracking. Then Enable completion tracking in Course setting as well. You can manage Activity completion now. 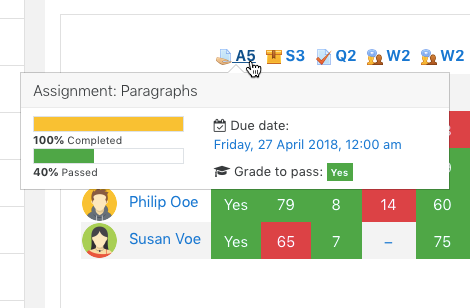 Activity completion allows you to define two basic rules – students can manually mark the activity as completed or you can show activity as completed when conditions are met, e.g. student must view this activity to complete it, student must receive a grade to complete this activity or student must submit to this activity to complete it. Expect completed on date is available – this date is shown in activity popover as due date if you enable it. Switch role to ... strictly defined permissions and GDPR ready! 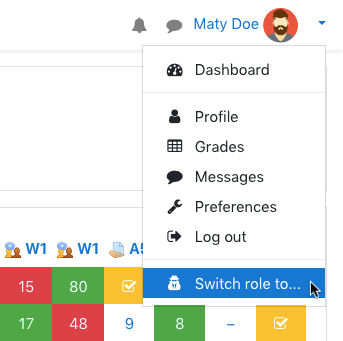 Teacher (includes manager and course creator roles) can edit activities by clicking on activity headers. Grade to pass setting is available. Links from activity headers goes to activity editation. 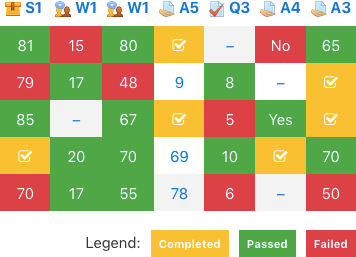 Links from grade table cells goes to activity grading. Filtering by groups is available as well as pagination. Non-editing teacher can click only on activity header. Links goes to activity detail. Filtering by groups is available as well as pagination. Student can click only on activity headers. Links goes to activity detail. Pagination is available. If student is part of defined group, only students from the same group are shown in the eTask table. You can change this permissions in Course administration -> Users -> Permissions. Better customization with new features – activities sorting and grading table placement. For better customization the most of the plugin configurations were moved to the course format settings. eTask topics format is more usable than ever before! Is the sorting of activities by the latest uncomfortable for you? Never mind! New ability to sort activities is here – by the latest, by the oldest or as they are in the course. Do you want to the content of the course first? Now you can choose the placement of the eTask above or below the course sections. Still not enough? Try it and let me know – we can improve it together! You can edit course format settings by Edit settings in the course. There are five configurable fields: eTask private view, eTask progress bars, eTask students per page, eTask activities sorting and eTask placement. Do you have some idea to improve eTask topics format? Contact me! Write comment below or private Moodle message. Do you find some bug? Write comment as well or Create issue! If more information needed, go to Versions, choose your Moodle version and click learn more. And ... why am I doing it? For us – teachers and students! Thanks so much Martin – you're a champion. This course format is an absolute favourite of our instructors and students. Hello Martin, I'd love to use this plugin. Because it is easy to see for a student if they have passed or failed an assignment and they can see if the assignment is submitted or not. Love the potential of this. Dear Martin. Thanks a lot. You are the best. Everything is fine and I'm really thankful to you. Thanks again for your amazing module and work. set course format to eTask topics format. Hi Martin, handy pluggin, is there anyway I can show a 'Resource' such as a URL or Label? I want to show it in the eTask Progress bar as complete/incomplete based on whether the activity conditions have been met (i.e. Show activity as complete when conditions are met - Require view, Student must view this activity to complete it). Hi Luke, as the activity completion feature is available from Moodle 3.3, it is implemented in eTask 3.3 for both of this Moodle versions, e.g. Moodle 3.3 and Moodle 3.4. Enjoy it! Thanks for share your amazing module. There something that is a little confuse about the order of the a activities, the order Right to Left, but maybe for some people like me prefer a order Left to Right. New version of moodleplugin eTask coming soon. Most configuration will be moved to the course settings (better customization). It will include the ability to sort activities by the latest, by the oldest or as they are in the course. Placement of grading table above or below the course sections will be available with the new eTask version as well. Hi. Just upgraded to the latest version and the grading section no longer has a scrollbar but simply goes off to the right of the screen forever (or for the length of the data). HI, I fixed some notices and warnings. I checked the horizontal table scrolling as well and it seems to works fine. Download the latest eTask version and try to purge all caches. There is known issue with non-existing block_myoverview/progress-chart template for Moodle 3.6. I am working on fix. See https://bitbucket.org/drlikm/etask/issues/12/moodle-362-build-20190118-error please. Issue with non-existing block_myoverview/progress-chart template for Moodle 3.6 fixed! Download the lates version of module for Moodle 3.6.